With the beginning of Summer we also have the beginning of Row by Row Sew Musical. Starting today thru September 4, 2018 Row by Row is sharing harmonious tunes at many quilt shops across the United States and worldwide. Free pattern are available starting today. Kits are ready as well. New fabrics are pouring in almost everyday. Lots of Fall/Halloween, Christmas and winter fabrics. 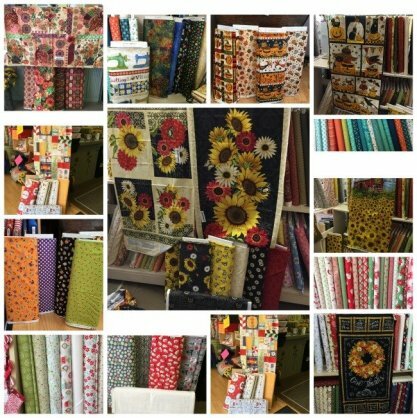 Fabrics from Wilmington Prints, Timeless Treasures, Moda, Maywood, Blank Quilting, Studio E and Contempo. Come shop today and see what the UPS and Fedex trucks have dropped off. Door prizes and light refreshments! Special discount on purchases when you attend the event. Check out this cute mini and make it just in time for the Fourth of July festivities. Enroll today. Class fee includes pattern. Bring you own fabric or kits will be available. Please note new day - Thursday - this month only!